Muckle-Wells syndrome (MWS) is a rare autoinflammatory condition caused by the overproduction of interleukin-1β (IL-1β). MWS is due to heterozygous mutations in NLRP3, the gene encoding cryopyrin, which regulates the production of IL-1β . Systemic inflammation causes recurrent fever, urticarial rash, joint deformities, and sensorineural hearing loss of various severities. 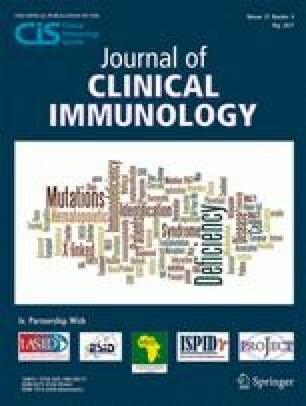 Canakinumab, a human anti-IL-1β monoclonal antibody that selectively blocks IL-1β, has been licensed for cryopyrin-associated periodic syndrome (CAPS) including MWS since 2011 in Japan, but there has been no report of its efficacy and safety during pregnancy. This case report describes the clinical course of a MWS patient administered canakinumab during pregnancy. This is the first study to show that the canakinumab administered during pregnancy in a patient with Muckle-Wells syndrome crossed the placenta. The measurement of canakinumab concentration was performed by Novartis Pharma AG and Novartis Pharma K.K. ME wrote the manuscript and KI, MM, and TK reviewed the manuscript, and all authors reviewed the manuscript and approved the final version. Written informed consent was obtained from the patient for continuous treatment with canakinumab during pregnancy, and for publication of this report. All procedures performed in the study were in accordance with the Helsinki principles. TK and ME have received speaking fees from Novartis. Tokyo Medical and Dental University (TMDU) has received unrestricted research grants for Department of Lifetime Clinical Immunology from Chugai Pharmaceutical Co., Ltd., Ono Pharmaceuticals, Mitsubishi Tanabe Pharma Co., UCB Japan, CSL Behring, Towa Pharmaceutical Co., Ltd., Abbvie Japan Co., Ltd., Japan Blood Products Organization, Ayumi Pharmaceutical Co. and Nippon Kayaku Co., Ltd. MM has received lecture fees from MSD K.K. and AbbVie LLC and received consulting fees from Daiichi Sankyo Co., Ltd. and Taisho Pharmaceutical Co., Ltd. This work was supported by grants from the “Research on Measures for Intractable Diseases” Project: matching fund subsidy from the Japanese Ministry of Health, Labor, and Welfare.